The Annual Catholic Appeal provides not only direct support to the materials needs of people, but spiritual nourishment as well. Blessed Teresa of Calcutta School eighth grade students Kaitlyn Layton, center, Mekhi Pebbles, left and B.J. Smith prayed at Mass at the parish in Ferguson in January. The Annual Catholic Appeal supports schools such as Blessed Teresa of Calcutta through elementary school assistance. When Catholics proclaim “I believe” in the Nicene Creed at Mass, it’s more than just an affirmation of a belief in the Church. It’s a response to God — an expression of desire to know Him and to share gifts with others. The theme of this year’s Annual Catholic Appeal — “I Believe” — is a manifestation of that affirmation of God’s presence. In saying “yes” to the appeal, support is given to dozens of important Church ministries that touch people of all faith traditions. The goal of this year’s campaign is $14.2 million. The appeal will be conducted in parishes the weekends of April 27-28, May 4-5 and May 11-12. Supported ministries include outreach to people who are homeless and others living in poverty, Catholic education, faith formation, defending life and support for vocations, among others. The appeal provides not only direct support to the materials needs of people, but spiritual nourishment as well. 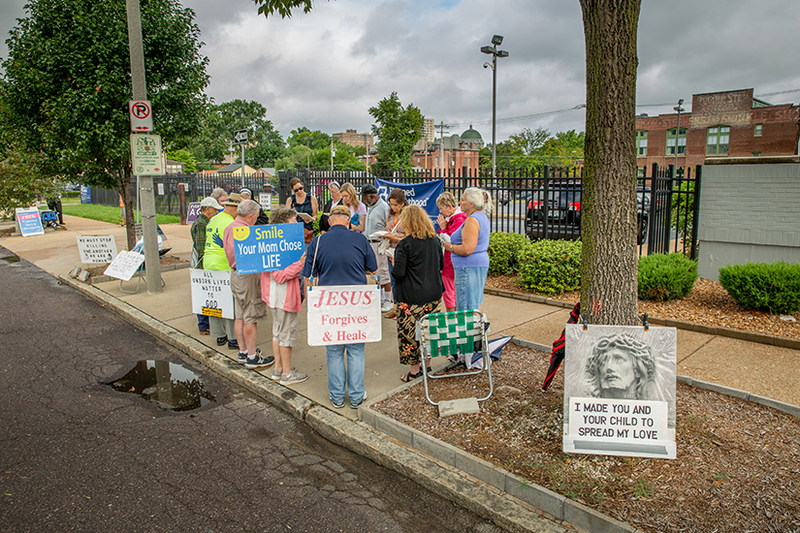 Pro-life supporters prayed a Rosary on the sidewalk outside of Planned Parenthood. The Annual Catholic Appeal supports Our Lady of Guadalupe Convent, a place for prayer near the abortion clinic. Kristin Weiland used to go by herself to pray on the sidewalk in front of Planned Parenthood. It was a little intimidating at first, she admitted, but then a friend invited her to join a group of men and women who regularly visit the sidewalk on Tuesday mornings. When they learned that a convent had opened across the street from the clinic, they became excited. 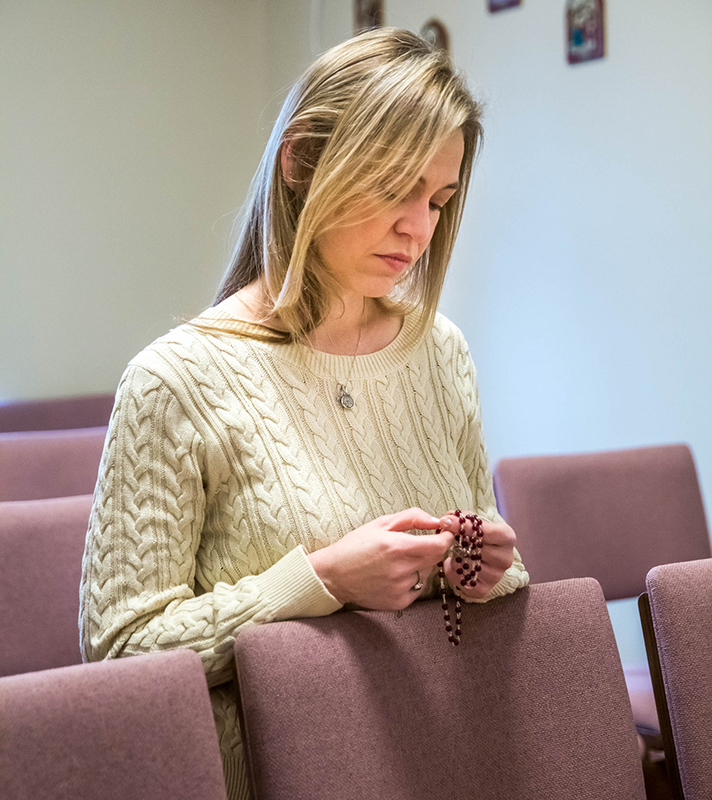 Kristin Weiland, a pro-life supporter, prayed the Rosary in the chapel at Our Lady of Guadalupe convent. In August of 2017, two Franciscan Sisters of Christian Charity made a seven-hour journey from their motherhouse in Manitowoc, Wis., to establish a new convent and ministry in the Archdiocese of St. Louis. The Our Lady of Guadalupe convent fulfills a dream of Archbishop Robert J. Carlson to have a place of prayer close to Planned Parenthood. The sisters’ presence comes at a time when Planned Parenthood is down to one clinic that offers abortions in Missouri. The Columbia, Mo., clinic stopped offering abortions in October after its abortion facility license expired. A clinic in Kansas City, Mo., also ceased providing abortions earlier in 2018. Sisters Sue Ann Hall and Delores Vogt are encouraged that the convent supports those who stand on the sidewalk as witnesses — either praying or providing information on alternatives to abortion to women who come to the clinic. The convent also offers adoration and Mass at other scheduled times, including during the 40 Days for Life campaign in the spring and fall. In January, Mass and adoration were offered on Monday mornings to mark the Roe vs. Wade anniversary and pray for an end to abortion. From the sidewalk, Weiland said that the sisters’ presence is the spiritual encouragement that provides exactly what she needs to keep coming back. “It’s a little piece of heaven that welcomes us with open arms,” she said. 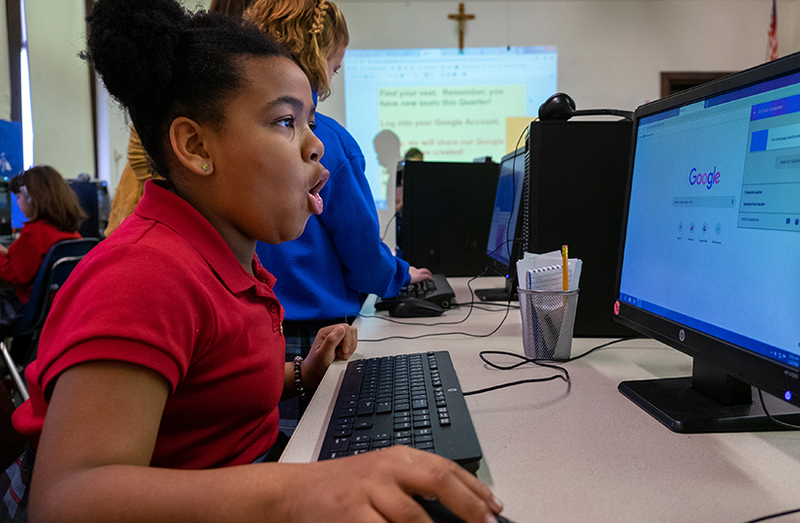 Blessed Teresa of Calcutta School third-grader Kameryn Holland worked on a computer in class at the school in Ferguson. The school, supported by the Annual Catholic Appeal through elementary school assistance, is celebrating the 100th anniversary of Catholic education at the site. 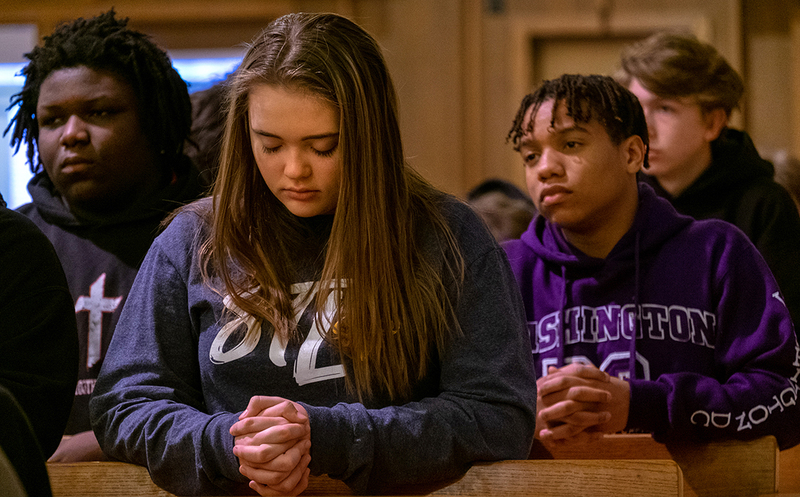 Students at Blessed Teresa of Calcutta School filled roles as lector, choir members, readers and more at a weekday Mass for Peace and Justice Jan. 23. The student-lector quoted from Dr. King’s “I Have a Dream” speech, noting that the slain civil rights leader was trying to bring peace to all people by bringing them together. Jesus came “to lead us to the Kingdom. He came to break down the walls that separate us. He trusts us to do the same,” he said. Blessed Teresa of Calcutta School is celebrating the 100th anniversary of Catholic education on the parish site at Chambers Road and Elizabeth Avenue. Sts. John and James School welcomed its first students for class on Sept. 6, 1918, in a temporary building on the parish’s property. The Annual Catholic Appeal supports schools such as Blessed Teresa of Calcutta through elementary school assistance, slated at $2 million, and the Today and Tomorrow Educational Fund scholarships, slated at $100,000 if the Appeal meets its goal. Blessed Teresa of Calcutta School staff are committed to providing a safe, caring, and challenging educational environment that promotes learning and achievement, builds character and establishes a foundation of faith by sharing the values and teachings of the Catholic Church. In the fourth-grade classroom after Mass, teacher Emily Zesch used a Smartboard to engage students in pointing out errors in sentences. They discussed a sentence’s subject and predicate, words that are homophones and other concepts. In their editing of the sentences, students plugged in an apostrophe where needed, capitalized letters where necessary and more. In November, Archbishop Robert J. Carlson blessed the new Rural Parish Clinic that will help the rural poor. The clinic is supported by the Annual Catholic Appeal. 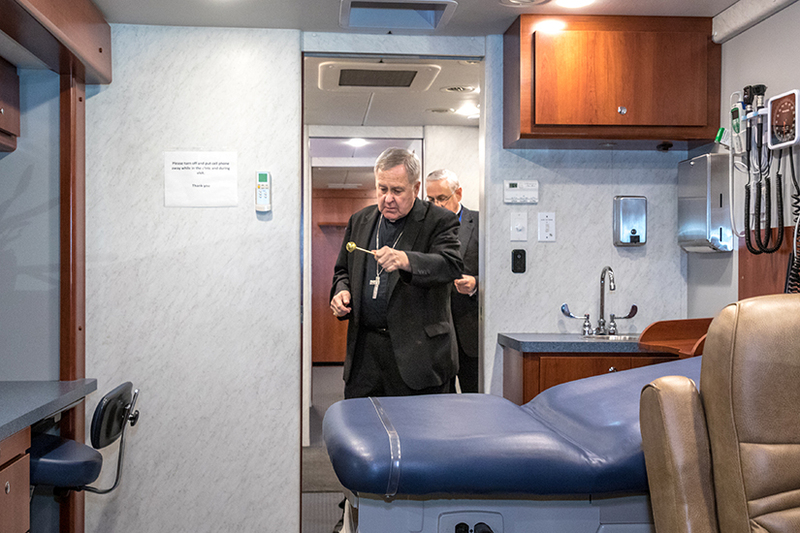 A new mobile medical clinic provides health care and social services to the uninsured poor in rural communities of the Archdiocese of St. Louis, starting with Washington County. The clinic is operated by Catholic Charities of St. Louis in collaboration with the Rural Parish Workers of Christ the King, which has ministered to the poor of Washington County for more than 70 years, providing food, clothing, shelter and utility assistance. The clinic will be based at St. Joachim Parish in Old Mines, which provides its facilities for intake and a waiting room. Patients are seen in a 40-foot van that includes two examination rooms. Sister Marie Paul Lockerd, RSM, DO, a family practice physician, and Dr. James Lord, a retired Mercy family practice physician, provide the primary care; volunteer registered nurses offer patient education and assessments. 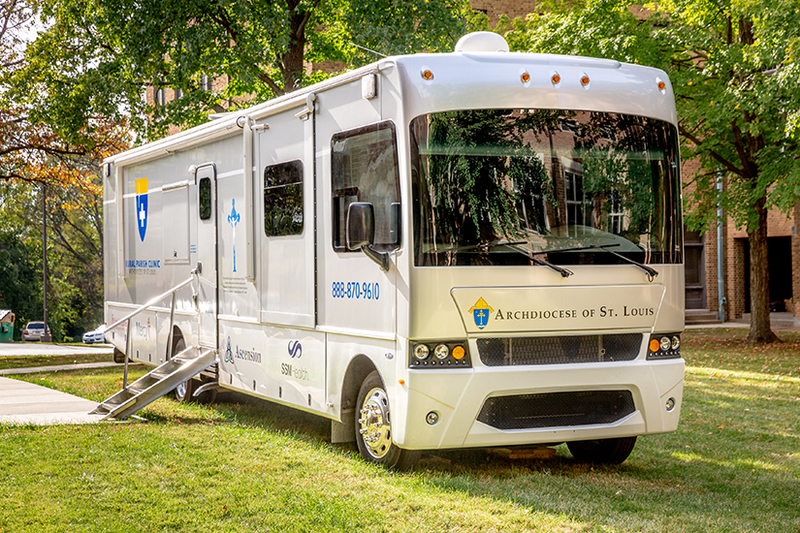 A new mobile medical clinic will provide health care and social services to the uninsured poor in rural communities of the Archdiocese of St. Louis, starting with Washington County. Services include preventative care such as annual physicals, treatment for chronic illnesses, acute care for minor illnesses, injuries and infections, as well as gynecological and mental health services. Several Catholic health care systems are providing assistance, including electronic medical records from SSM Health; X-ray services from Mercy; and assistance with business operations and medical supplies from Ascension Health. Catholic Charities is providing case management, social services and collaboration with other community agencies to help with long-term needs, such as education and employment, housing, mental and emotional health, substance abuse, counseling and transportation. In Washington County, 14 percent of the population under age 65 does not have insurance, according to county health rankings data published in 2018. Approximately 21 percent of people in the county also report having fair or poor health. The median income in Washington County is about $37,000, according to the U.S Census Bureau, which is below the national median of $49,000. “We hope this clinic can provide health care to prevent unnecessary ER visits and hospitalizations, thus saving local tax dollars,” said Sister Marie Paul. His parishioners understand that the Annual Catholic Appeal “doesn’t just go to support some vague thing out there,” but provides for essential needs, the pastor noted. Education is another big recipient of Appeal funding, and St. Michael is proud of its participation in Holy Cross Academy, Father Grosch said. Appeal funding for the retirement home for priests nearby in Shrewsbury, Regina Cleri, also resonates with parishioners since a beloved former pastor, Father Edmund Fitzgibbon, lived there before his death last year. And the archdiocese’s seminary, Kenrick-Glennon, is a part of the Shrewsbury community and parishioners have a connection to it. The seminary receives funding from the Appeal, also. The financial goal of the 2019 Annual Catholic Appeal is $14.2 million. Approximately 91 cents of every dollar raised goes back into the community in the form of direct services. The appeal will be conducted in most parishes the weekends of April 27-28, May 4-5 and May 11-12. To learn more about the Annual Catholic Appeal, including the agencies and organizations supported by the Appeal, visit www.archstl.org/aca or call 314.792.7680. None of the money raised by the Annual Catholic Appeal is used to defend or settle criminal or civil lawsuits related to the clergy abuse crisis.